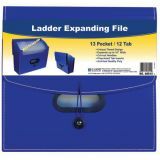 The Ladder Expanding File features unique tiered design that allows for easier access to important papers and documents. 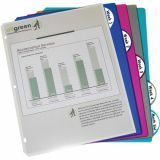 It does not take much to get your binder organized. 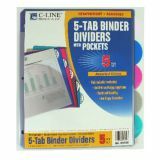 Simply use these index dividers to create sections within the binder. This will instantly make it easier to locate information. Made from durable, acid-free polypropylene. Fits standard 3-ring binders. 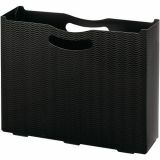 Includes double-sided easy-load slant pockets to allow for extra storage of documents and media. 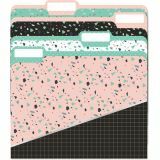 Assorted colors include blue, aqua, pink, smoke and clear. Magazine Files are made of sturdy, durable plastic. Color-code your magazines by volume & issue, or use them to store stationery on your desktop. 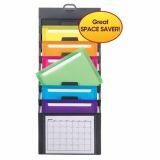 Manage multiple projects within a single portable file box. Sturdy poly file box holds up to 3" of files or materials and ca be used again and again. 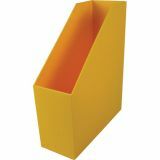 The poly file box is a handy desktop filing system for either file folders or hanging file folders. In drawer, on desk, on the go! Letter-size, 3" capacity. Black.